Durability, performance and value are hallmarks of Adam’s classroom balances. Dependable and durable, Adam balances offer precise performance and outstanding value, making them the right choice for every science classroom. 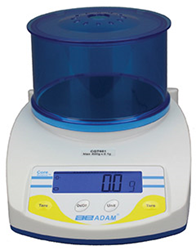 Adam Equipment, a global manufacturer of professional weighing equipment, will present a selection of education balances at the 2016 Global Educational Supplies and Solutions (GESS) show from 1-3 March at the Dubai World Trade Centre, UAE. Visit Adam at stand M36 in Za' Abeel Halls 4-6 to learn about our selection of balances designed for classrooms. Dependable and durable, Adam balances offer precise performance and outstanding value, making them the right choice for every science classroom. During GESS, visitors can interact with Adam’s Nimbus analytical and precision balances, Highland portable precision balance, Core portable compact balance, Dune compact balance and CB compact balance. Created for all levels of students Nimbus analytical and precision balances feature a compact footprint to economise space in tight classrooms. Nimbus is easy to operate, helping students execute functions without needing extensive training. The balance's software contains the features needed to perform science experiments, ranging from basic weighing to more complex, college-level research assignments. Solid metal construction is durable, so Nimbus can withstand chemicals and rigorous daily use. With its innovative stackable design and practical features, the Highland portable precision balance is a winning choice for teachers seeking affordability and durability in a balance. Highland is powered with either an AC adapter or rechargeable battery, so it transports easily between classrooms. A weigh-below hook facilitates density and specific gravity measurements, while ShockProtect helps prevent damage from accidental overloads. The Highland features HandiCal for quick, intuitive calibration without external weights, ensuring consistent measurements. To deter theft, the Highland is equipped with a built-in security slot that accommodates an optional Kensington-type lock and cable. Compact and easy to use, the Core portable compact balance is unbeatable for value and features. Durable ABS housing withstands field and classroom environments, and the stainless steel pan is removable, making it simple to clean. ShockProtect safeguards the load cell, so the Core can handle overloads without damage. To help prevent theft, a built-in security slot accommodates an optional Kensington-type lock and cable. A convenient weigh-below hook facilitates below-balance weighing for density and specific gravity measurements. The Core operates by battery or AC adapter, so it’s easily portable. For reliable performance and value in a classroom balance, the Dune compact balance is the answer. An ideal choice for teachers and students, the Dune's large pan and splash-proof keypad are easy to keep clean. The low-profile design of the balance makes it portable and simple to stow when classroom storage space is at a premium. With just three buttons, the Dune is simple to operate for students of all ages, abilities and levels. Equipped with AC adapter and battery operation, Dune can be used in education settings where power is unavailable. Unrivaled in capacity and readability among its peers, the CB compact balance offers a combination of value and portability. With a streamlined design and compact size, the balance can be stored in tight classroom space. The grade 304 stainless steel pan is simple to clean, while the CB's one-piece ABS housing and sealed keypad help protect internal components from dirt and spills. Uncomplicated operation is ideal for elementary and middle school students performing basic weighing tasks. Powered by an optional AC adapter or AA batteries, the CB can be used in outdoor learning settings.